RSS Feed for keyword: "Pictures of Gros Morne National Park"
Gros Morne National Park, declared a UNESCO world heritage site in 1987, is a place for people to connect with nature through hiking, cycling, kayaking, boat tours, fishing, bird watching and other activities. The park is situated on the Viking Trail, along the west coast of Newfoundland. Due to its varied landscape, the park has a rich diversity of plants and animals. The park encompasses lowlands, beaches and sea-stacks along the Gulf of St. Lawrence, and soars to the heights of the alpine plateau of the Long Range Mountains. The park’s rock formations, which have helped geologists understand the concept of plate tectonics, are remarkable. The Green Gardens is just one of the many popular hiking trails in the park. It starts in the barrens of the rocky tablelands and drops through the forest to the volcanic seacoast, with inviting cliff-top meadows, sea stacks and coves. Interesting Photo galleries related to "Pictures of Gros Morne National Park"
A picture taken on a beautiful evening along the beach at Green Point in Gros Morne National Park of Newfoundland. 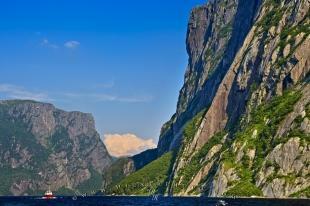 ...Continue gallery information: On a tour of Western Brook Pond, one can view stunning cliffs and beautiful waterfalls. The Discovery Centre, located on the south side of Bonne Bay, provides a good introduction to the parks natural and human history. The Lobster Cove Head Lighthouse, built in 1897, marked the entrance to Bonne Bay and today houses an interpretive exhibit. Other stops of interest to check out are the 1919 shipwreck S.S. Ethie, and fishing history of the Mudge family at Broom Point. There are several campsites within the park, and visitors also have the option to stay at accommodations in one of the seven small coastal communities surrounding the park. 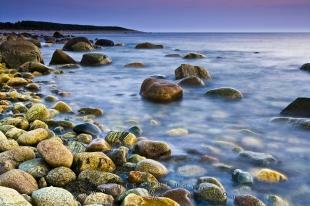 These communities were originally developed in the early 1800’s, as fishing villages. From the sea to the mountains, to the immense freshwater “ponds,” Gros Morne National Park is a destination of choice for tourists and photographers to explore Newfoundland’s wilderness and human history. 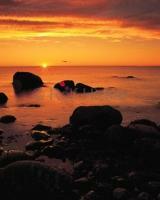 Enjoy our selection of Gros Morne Pictures and Photos.